For many years a number of major pharmaceutical companies have pursued a solution for hair loss. Thousands of different compounds have been produced in a variety of creams, pills, injections, soaks, wraps and treatments with only limited success. Meanwhile another group of researchers have focused on holistic remedies and organic ingredients in the hope of finding a cure for hair loss naturally. The problem with their approach was that they were focused too narrowly on solving the problem with only one method while excluding all others. Follixin is different because of its unique two-pronged approach. 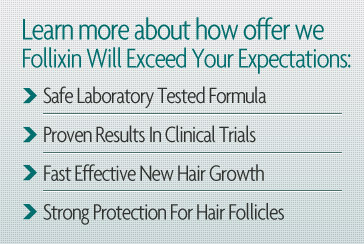 Follixin rejuvenates clogged pores to strengthen hair follicles at their roots which prevents new hair loss while simultaneously opening the aperture of your hair follicles and thickening the sheath of each hair during the formative stage of growth to revitalize areas of your scalp that have become dormant. Follixin works from the inside out as part of a dietary supplemental regimen carefully designed to provide exactly the right amount of nutrients in a scientifically controlled manner. Unlike creams and lotions that are impossible to apply evenly or other treatments that 'wear off' inconsistently, Follixin is with you every step of the way as you regain your hair and your self-confidence. 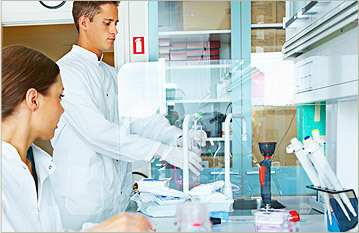 Thanks to decades of existing research, volumes of clinical trial reports and a wealth of experimentative data, Follixin researchers using powerful algorithmic methods (similar to the way a search engine finds pattern in massive amounts of data on the internet) were able to cull key factors from the prior research and medical journal reports of previous efforts to develop a real solution capable of restoring hair. When seeking an answer to scientific problem, often the hardest part is knowing what questions to ask. Many of the ingredients in Follixin were used in other remedies but the specific formula, set of ingredients and proportion of each within every Follixin tablet is unique to our trademarked brand. Our proprietary formula works, and has been proven successful in numerous double-blind studies, clinical trials and related analysis. Partly because of new proprietary research performed by our own chemists and Doctors - but also in large part thanks to the public records of massive amounts of research provided by leading pharmaceutical labs and holistic treatment centers who have made their findings available to the scientific community for further extrapolation. That's why when you try Follixin you are benefiting from years of research that have gone into every tablet and every bottle. The winning formula is the one that has finally managed to put all the pieces of the hair growth puzzle together the right way.